One of Bitcoin’s biggest players is turning to immersion cooling to address the shifting economics of cryptocurrency mining. Bitcoin hardware specialist BitFury Group said today that it will acquire cooling specialist Allied Control. One of Bitcoin’s biggest players is turning to immersion cooling to address the shifting economics of cryptocurrency mining. Bitcoin hardware specialist BitFury Group said today that it will acquire Allied Control, a startup known for designing a high-density bitcoin mine in a Hong Kong skyscraper. The deal is a vote of confidence in immersion cooling, in which high-density hardware is dunked into fluids similar to mineral oil. BitFury's move suggests other mining players may also examine liquid cooling as a tool to slash operating costs following a price crash, which has altered the economics of bitcoin and caused a shakeout in the mining sector. The acquisition may also boost the use of data center containers to allow bitcoin miners to shift capacity to areas with cheaper power costs and renewable energy sources. BitFury is a leading maker of specialized semiconductors for Bitcoin transaction processing (“mining”), known as Application Specific Integrated Circuits (ASICs). Last year BitFury raised $20 million in venture funding to roll out a global data center network, including facilities in Finland, Iceland and the Republic of Georgia. Allied Control creates extreme density data centers for high performance computing. Last year it expanded into bitcoin, creating tanks filled with Novec, a liquid cooling solution created by 3M. Each tank houses densely-packed boards of ASICs. As the chips generate heat, the Novec boils off, removing the heat as it changes from liquid to gas. The system is extremely efficient, with one client reporting a Power Use Effectiveness (PUE) of 1.02. 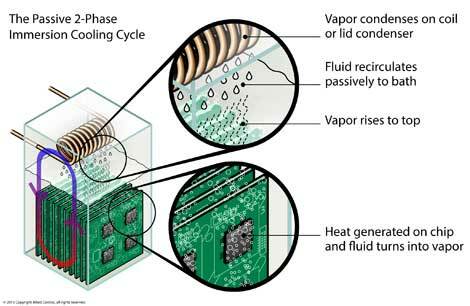 BitFury says that using immersion cooling will reduce operating expenses on data center maintenance as well as on lowering its PUE. It has been working with Allied Control on proof of concept (POC) for its immersion-cooled data center. "The results, so far, are very promising and we are looking forward to significantly scale up soon," the company said. The shift to immersion cooling reflects a sharper focus on data center efficiency by industrial mining operations, whose profit margins have been squeezed by the recent collapse in the price of bitcoin. After soaring as high as $1,100 in late 2013, the value of a bitcoin has plunged to about $230. This has had a huge impact on bitcoin cloud mining, with some firms shutting down or halting payouts to customers. 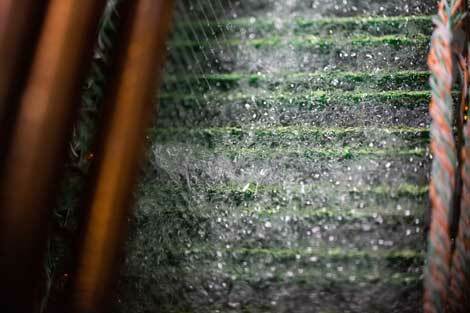 In addition to supporting extreme power density, immersion cooling has the potential to slash the cost of data center infrastructure, allowing users to operate servers without a raised floor, computer room air conditioning (CRAC) units or chillers. It also allows ASICs to operate without fans, which are typically among the largest components of a bitcoin mining rig. Allied Control’s immersion cooling tanks are ideal for bitcoin mining because they support rapid hardware refresh cycles. The backplanes housing the ASICs are designed to support multiple generations of chips. This is of particular interest to BitFury, which has updated its ASIC design three times over the past two years to keep pace with the arms race in bitcoin hardware. In 2013 bitcoins were mined using CPUs and GPUs, followed briefly by FPGAs (Field-Programmable Gate Arrays), and then the launch of custom ASICs. BitFury previously has used designs known as hashing centers, which combine high density and low redundancy and are often built in warehouses or other powered shells. The facility features a broad hot aisle, in which hot air exits the back of the racks and is vented through the roof of the coop-style building. The clear plastic barriers above the racks prevent the hot air from mixing with the cold aisle, which enters the rows of ASIC rigs from a cold aisle along the perimeter of the building. One of Allied Control’s innovations is the DataTank, a container-based system designed to deploy immersion-cooled bitcoin hardware in increments of up to 1.4 megawatts at a time. BitFury sees this design as optimal for rapid deployment of capacity. "We will use best practices and experience in building DataTanks with custom modifications in order to deploy new, more efficient and low cost solutions for new BitFury ASIC chips," said BitFury, which is examining several strategies for deploying new capacity. The DataTank model would allow BitFury to quickly create new data centers in remote areas that offer cheap power. An intriguing option for industrial bitcoin miners would be tapping solar arrays or other sources of renewable energy, a model Microsoft has been exploring with methane-powered containers. Servers could also be housed near utility bulk transmission lines to capture cheaper rates, a concept being tested by BaseLayer in Phoenix. BitFury's focus on immersion will get the attention of other industrial bitcoin mining operations. After focusing on more powerful hardware as they scaled up in 2014, these huge mines are now looking to streamline their data center operations. The price decline of bitcoin has accelerated that process, and may prompt others to test-drive immersion technologies. The success of Allied Control and its bitcoin cooling solutions has served as a major validation for 3M, which has been touting the potential benefits of open bath immersion for years. The technology was initally demonstrated at Data Center World in 2012. It's not immediately clear what a shift to immersion cooling by bitcoin miners might mean for data center service providers, who have struggled with the economics and shifting tides of bitcoin. C7 Data Centers recently filed suit against bitcoin specialist CoinTerra, saying the customer owed more than $1.4 million in hosting fees. Immersion cooling is relatively rare in multi-tenant service provider data centers, but there have been some recent examples with interesting economics. Last spring data center service provider CyrusOne signed a lease for 41,000 square feet of space in its Phoenix data center for a customer housing high-density equipment in immersion cooling tanks. CyrusOne delivered the space at a cost of $1.5 million per megawatt, significantly below the $7 million per megawatt the company typically spends on enterprise data center space with “five nines” of uptime. CyrusOne didn’t identify the tenant or its business, but the deal aligns closely with the requirements of Bitcoin miners.